Here we are. On the road again. 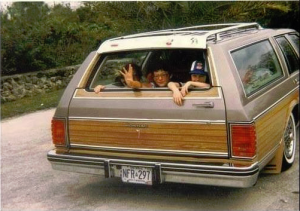 All of these organizations in the autism family station wagon heading to Wally World. No. No we are not. And we still have a long way to go, so stop poking your brother. If he is bothering you, look out the window and see what else you can see but do not poke back. Stay on your side. Keep your hands on your lap. When we stop for gas you can each poke each other hard once but you will have to wait until we stop. And right now, we can’t stop because we still have a long way to go. We know it is cramped with all of these different organizations in here. Especially since you don’t all like being in the same car, traveling down the same road not really knowing where we are going. Everyone is yelling directions and fighting about which way to go to get there faster. Our driver would get a headache if only someone was actually driving the car. Without one, we are weaving all over the place and it is a wonder we haven’t run into a ditch. No. No we are not. For the last decade, The National Institutes for Health has addressed the fastest growing developmental disability by spending 20 cents for each person living with autism per day and while it isn’t the United States’ job to find answers for a significant worldwide health issue – globally, that translates to 1 penny per person with autism worldwide per day for research. Two dimes or a penny. No. No we are not. Without a driver driving every day, it is hard to tell if we are going around in circles. We pass signs then say – didn’t we already see that eye gazing study before or didn’t we study behavioral therapy a couple of miles back? No. No we are not. In the ten years since that landmark legislation was enacted, the diagnostic rate of autism has increased from 1 in 250 kids to 1 in 68. That is an increase of from 16,000 children per year to 58,823 children per year. Because the budget has remained basically flatlined, that also means we are now actually investing 73% less in autism research per kid diagnosed each year than we were in 2005. No. No we are not. There are still thousands and thousands of children in this country who do not have appropriate access to treatment because Congress hasn’t entertained introducing legislation requiring federally regulated companies to provide coverage for autism treatment. Johnny’s parents who work for a smaller company and live in a certain zip code can help Johnny access medical care for his autism while Abby’s parent who live down the street and work for the local oil refinery can’t because they have to pay out of pocket and don’t have the money for it. Some large companies have voluntarily agreed to cover medical treatment for autism. That’s great but with this many people impacted, shouldn’t every person with autism wishing to have access to treatments and therapies be able to without going bankrupt because of where they work? No. No we are not. Not when our children are still struggling for a free and appropriate education. Not when we have to pass laws to stop restraint and seclusion. Not when we have children who wind up abandoned on school busses because they fell asleep in the backseat and no one was watching over them. No. No we are not. Not when our loved ones are handcuffed to hospital beds because they are screaming. Sometimes people yell when they have a four foot long ulcer in their small intestines and difficult behaviors can occur because of them, or when they have broken a foot but can’t tell you, or when strep bacteria has gotten into their brains and cause inflammation with really bad headaches. We need a medical system that will implement whole person treatments for underlying biomedical reasons for behavioral manifestations instead of jamming a kid with a four foot ulcer full of mind and mood altering chemicals. No. No we are not. We need law enforcement officials who are trained to help find people we love when they run straight out the doors of their school before they run into the water. No. No we are not. Not when there are no supports for our children after the age of 21 to care for them because we couldn’t access the care and our communities didn’t invest in them when they were younger to prepare them for a more independent adult life. No. No we are not. Not as long as we are fighting with each other instead of for each other. No. No we are not. Not as long as the Mommy wars continue and you insist on judging people for the way they choose to raise their children. I’m sure your essential oils doing awesome things while they make your kid smell like pot but maybe someone would rather just give their kid pot to stop their seizure activity. You don’t like the idea of giving Marinol to your kid to stop seizures. Fine. Don’t. Raise your own children your way. Let others raise theirs. Honestly – don’t you have enough to do in your own home than to worry about what is happening in someone else’s? No. No we are not. Not as long as we are stepping on one another to get ahead. Not as long as we aren’t reaching back behind us to pull another family up. Not as long as we are sitting behind our computers committing violent acts of sniping, cursing, gossiping, goading and slandering one another. Your words matter. The power of life and death are in the tongue so speak life or be quiet and just listen to someone else’s situation then learn something from their point of view. No. No we are not. Autism currently affects 1 in 68 children who were born in 2002 and we aren’t sure what the rate will be after that but a preliminary study released last fall indicates the number could be rising to 1 in 45 soon. If the diagnostic rate magically stops at the 2002 rate then at least 764,699 children have been diagnosed in the last 13 years and the CDC has not reported your kid in their count yet. As long as we want to drive in circles. So especially if the CDC hasn’t counted your kid yet, stand up and BE counted in Washington, DC on April 2nd at The Power of One March. Save the taxpayer’s pennies and show the next administration how many of us there are. Show them we aren’t just numbers. We aren’t just stats. We are one and each one of us has a life to live. Take a pit stop on this road trip and spend one night, marching side by side with people in this community no matter what they believe causes autism, no matter what they believe is the best treatment or if you should even treat it. No matter what. Because we are family. March the way you want to supporting the causes within our one united community that you believe in. Wear one bracelet or all six to support all 12 groups. After expenses, every penny will go back to directly help an individual with autism. We are giving it all away. Let’s take the first step this year to give the next administration a preview of our community so they will appoint us a driver – then work to make sure all groups participate next year. Maybe then we can finally get where we need to be. Support bracelets and souvenir t-shirts are available on demand until Wednesday March 23, 2016 at noon Eastern. Register today at www.thepowerofonemarch.org. Make plans to attend by reviewing the GET THERE tab for hotel accommodations, airline and train discounts. See you in DC.